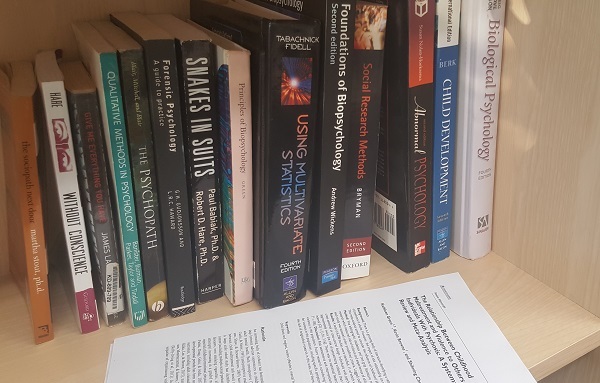 Publishing your first paper in psychology is naturally daunting but hugely rewarding. Publishing research allows you to share your work with the world. You can have a real impact on theory and practice. It will also help your career and employment prospects. The basic structure of a research paper is fairly simple. You introduce the topic, identify the gaps in the existing knowledge and the specific question(s) you are trying to answer. Then you describe how you have chosen to answer those questions (in enough detail for someone else to replicate your methods). You describe your results, then what these mean for theory and for practice. Finally you identify any limitations to your findings and areas for future research. Sounds straightforward enough. However, in psychology generally and in forensics particularly, we are often trying to measure intangible concepts in vulnerable populations. There may be hundreds of potential confounding variables and practical difficulties in obtaining the information we need. Plus we have endless fascinating questions we want to answer. It is so easy to get lost in piles and piles of data and analyses and lose track of your original question. Probably the most common feedback I have had so far from reviewers is to focus on the main question and reduce the number of analyses. If you have completed a big piece of research, you can consider breaking it down into smaller articles. This is sometimes easier than trying to cram everything into one paper! Call it a defectiveness schema or impostor syndrome, a lot of us live with the basic sense that we are not quite good enough. This also brings the absolute terror that one day we will be found out. Submitting a research paper means asking strangers to criticise your hard work, which triggers all of these feelings. A common way to compensate is to use highly technical or overly complex language. I do this myself, both in practice reports and academic writing. If I am writing about something and I am less confident in my knowledge, I will tend to use more advanced or obscure language and very long sentences. Your language should be appropriate to your field and audience, technical terminology is great if it helps to make your points more clearly. However, if you find yourself constantly using the synonym function in word remember that the most important thing is to make your points clearly. Have a friend (ideally from a different field) read your work before you submit it. They should be able to understand your research without having specialist knowledge. You might be working with several co-authors who each write a section of a paper. Alternatively, you might have written various sections of your own research at different times. This means that it is easy to lose the flow of an article, or for the style of writing to change throughout a paper. Things like changing terminology halfway through a manuscript or inconsistent writing styles will confuse your reader. Before you submit, make sure you go through the whole paper to check the paragraphs flow in a logical order. This helps to develop your arguments clearly, and help people understand your research. Check for inconsistencies in language, terminology and writing style. This might involve all the authors sitting down together and agreeing the best way to communicate your findings, or one person taking responsibility for ensuring consistency in the final paper. When choosing a journal, make sure you are familiar with its aims and scope and think about whether your research fits. Read recently published articles to get a feel for the journal style and its audience. Think about whether you want to reach an international audience, and consider the journal’s impact factor. Once you have chosen, make sure you read the author guidelines carefully (always available online). Each journal has its own requirements for style and submission. These guidelines will give you clear advice about the format and length of your article, as well as things like referencing style. Make sure you check them carefully, it can be embarrassing to have something sent back to you because you have used the wrong referencing (trust me). Peer reviewers are human beings, who will have once submitted their own first papers. Part of their job is to help you improve your article. It is often difficult to receive criticism, particularly when you have worked hard and feel passionately about your field. However, their feedback is valuable; you will receive detailed advice that can help you improve your study. Even if a paper is rejected, you can edit it according to the reviewer’s comments and think about submitting it elsewhere. Do not be disheartened, this happens to most people at some point. Think of a peer review as a good way of getting free expert feedback. This might be particularly useful before a viva exam! This post was authored by Dr Kathleen (Kate) Green. If you have any other tips, feel free to share them in the comments!